Daniel Pecaut and Corey Wrenn run an Iowa based investment firm and have been regular attendees of Berkshire Hathaway annual meetings for over thirty years. Their meeting notes form the raw material for their recent book, University of Berkshire Hathaway. Over the past three decades, Berkshire’s meetings have grown from approximately 500 attendees to over 40,000 and the events have become much more elaborate and carnival-like. However, the core message delivered by Warren Buffett and Charlie Munger has never really changed. While it is true that the types of businesses Berkshire has purchased have changed dramatically, most notably tilting toward capital intensive businesses in recent years, the underlying desire to purchase excellent businesses at fair prices has never wavered. The Berkshire Hathaway investment approach can be characterized as “simple”, at least on the surface, but in the world of finance, doing what is “simple” is not always “easy”. There are institutional biases that clearly favor doing what is complex over what is apparently simple. Traditional curriculum in finance has long been based on the notion of market efficiency. This supposed efficiency renders nearly all attempts to outperform the market to be akin to tilting at windmills. And there is an element of truth in this claim. Most markets are probably “efficient” most of the time. The error is extrapolating “most of the time” to “all the time”. The underlying assumption of market efficiency does make it possible to represent markets with equations that are seemingly as precise as formulas representing natural phenomena in physics. Business and investing could now be a “real science” and professors in the field could be accorded the respect that comes along with scientific recognition. The most famous formula in academic finance is probably the capital asset pricing model, but, of course, there are many other more specialized formulas such as the Black Scholes Model for pricing options. These academic models, by providing apparent scientific precision in a field of social science, introduce a certain level of complexity and a requirement that market participants demonstrate a minimum level of numeracy. No one would deny the need for a physicist to have a certain fluency in higher mathematics but, in the field of investing, Warren Buffett has long asserted that nothing more than basic mathematics is required. If that is the case, much of the progress in the field of finance over the past half century was a waste of time. And it is actually worse than that: many academic models have been colossal failures in practice and the consequence has been blow-ups in the real economy. So what is the Buffett and Munger approach? Attendees of Berkshire Hathaway annual meetings know that the leaders of the company constantly harp on topics such as understanding a company’s moat, evaluating the skills of the managers running the business, ensuring that one does not pay silly prices, and perhaps above all, insisting on a high degree of integrity. It is true that relatively arcane topics related to accounting sometimes come up, but typically these sermons have to do with accounting rules that distort actual business results – in other words, complexity that detracts from the fundamental simplicity of investing. But “simple” doesn’t necessarily mean “easy”. Not by a long shot. The judgment required to understand a business and make an evaluation of intrinsic value can take years to develop. As Charlie Munger has emphasized for decades, one must obtain a certain amount of “worldly wisdom” in a variety of fields. Through a multi-disciplinary approach of lifelong learning, anyone with a reasonably high IQ (think 120 rather than 180) should be able to accumulate a working understanding of enough “mental models” to be ready to strike when opportunity presents itself. The concepts are simple but obtaining the worldly wisdom requires years and decades of sustained effort. And the sustained effort and concentration required to obtain worldly wisdom is anything but “easy” for most people to accomplish in the age of Twitter and other distractions. The next best thing to attending a Berkshire Hathaway meeting (or, more recently, viewing the webcast) is to read accounts of the meetings which have become increasingly available over the years. Prior to purchasing my first shares of Berkshire Hathaway in 2000, I read and re-read Lawrence Cunningham’s compilation of Warren Buffett’s letters to shareholders. This compilation has since been updated to include all letters through 2015. Much of what is covered at annual meetings is also discussed in annual letters to shareholders and this collection provides tremendous insight into the Berkshire system. Mr. Cunningham’s compilation is arranged by topics rather than years so one can read all of Mr. Buffett’s thoughts on mergers and acquisitions, for example, spanning several years. This is very useful, although reading the letters chronologically (available for free at Berkshire’s website) is also very useful. Mr. Pecaut and Mr. Wrenn chose to present their meeting notes on a year-by-year basis which provides a contemporaneous account of the annual meetings. Their book is not a transcript of the Berkshire meetings but rather a set of curated notes that highlight the topics that they found most interesting. The notes tend to be longer for the later meetings which is probably mostly because the length of the annual meetings increased from two and a half hours in 1986 to well over five hours in recent years. They made a point to present the notes as a historical record, that is, mostly unaltered from when they took the notes and sent them to their clients. This is valuable because the commentary is not impacted by hindsight bias. For example, Mr. Buffett’s glowing account of David Sokol in the early 2000s remains intact despite Mr. Sokol’s fall from grace in 2011. Similarly, many of Mr. Buffett’s comments on macroeconomic factors, particularly inflation, proved to be incorrect but those notes are left intact. No one is infallible and the contemporaneous account of these judgments, later proven to be in error, highlight the wisdom of Mr. Buffett’s admonition to avoid investing based on macroeconomic factors. While readers mostly benefit from the fact that the authors do not alter their notes based on subsequent information, it might have been valuable to include a small commentary after each year to note material subsequent developments. One of the problems with the book is that it is difficult to read all of the notes on specific topics (such as inflation) because there is no index. One must go year by year and rely on taking notes to consolidate comments on specific topics. Perhaps this is not a problem for those who read books electronically, but it can be a little frustrating for those of us who still read physical books. All books of this type should really feature a complete index. 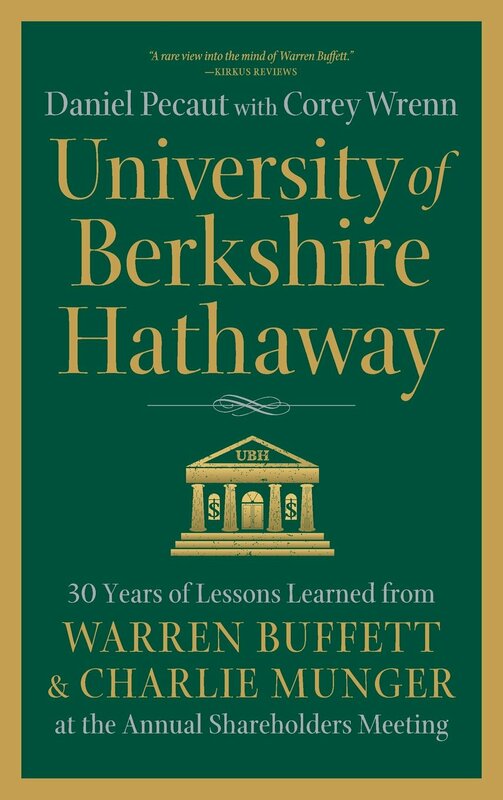 Despite the small shortcomings, anyone interested in Berkshire Hathaway will find this book interesting. Serious students of Warren Buffett and Charlie Munger will certainly want to also read the annual letters, either chronologically or through Mr. Cunningham’s compilation (or, better yet, both!). Certain shareholders used to take pride in how cheaply one could travel to Omaha and attend the Berkshire Hathaway annual meeting. Back in 2000, it was possible to stay downtown at non-outrageous prices, car rentals were reasonable, and it was common to walk in off the street and get a table for dinner at an Old Market restaurant after the meeting. Back then, “tuition” including airfare, lodging and meals could often be had for well under $500. Today, the cost of attending Berkshire Hathaway meetings has become prohibitive because the 40,000+ attendees overwhelm the small city’s capacity. For the past two years, Berkshire has webcast the annual meeting (a step we advocated back in 2010) with little impact on the number of attendees. The annual meeting is still worth attending in person at least once to see the carnival atmosphere and, for some, to shop at a discount. The rest of us can obtain a university class education in business simply by streaming the meeting over the internet. As of the date of this article, the 2017 meeting livestream is still available. Watch the webcast online for free and then buy ten or more B shares with the savings. Disclosures: The Rational Walk LLC received a review copy of the book. Individuals associated with The Rational Walk LLC own shares of Berkshire Hathaway.